babylondonorbital: Half of a Yellow Sun. By Biyi Bandele. A Soda Pictures release in cinemas on 11 April. London special screenings on 7 April @ Peckham Plex and Odeon Greenwich on 9 April. Both screenings with Chiwetel Ejiofor, Biyi Bandele and author Chimamanda Ngozi Adichie. Half of a Yellow Sun. By Biyi Bandele. A Soda Pictures release in cinemas on 11 April. London special screenings on 7 April @ Peckham Plex and Odeon Greenwich on 9 April. 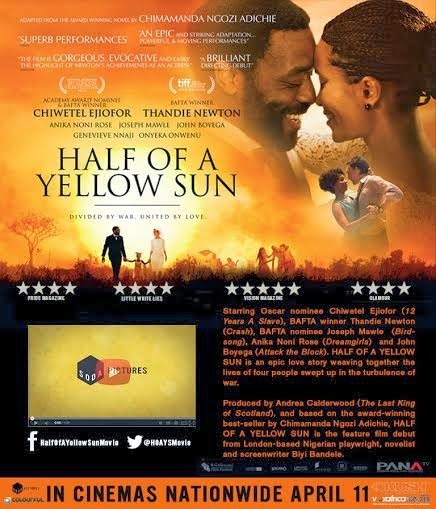 Both screenings with Chiwetel Ejiofor, Biyi Bandele and author Chimamanda Ngozi Adichie.